A World of Many Hats and Not Enough Shoes - Snak... I mean, Kids on a Plane! Snak... I mean, Kids on a Plane! Our family trip to Europe was the first plane ride for our three kids. 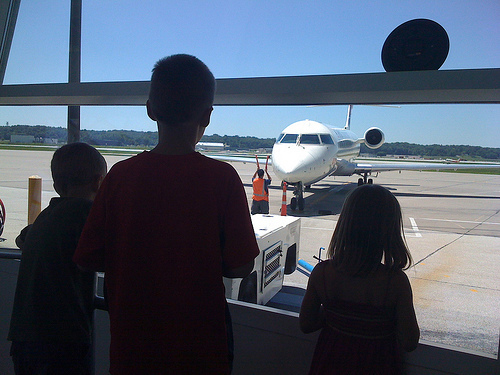 Not knowing what to expect or how to entertain a 9, 8 & 5 yr old on a plane ride for 2, 8 & 11 hours, I asked lots of questions and read many blogs/articles about flying with children (this one was great!). While most focused on traveling with newborns and toddlers, I did read some universal notes that really helped our trip. - New $10 toy. Prior to leaving, I let each of the kids pick out a new toy that was a something-to-do kind of toy. Zeke picked out an album for his sports cards with some extra packs of cards. He sorted his collection of baseball, football & basketball cards into the album while on the plane. It was a fabulous idea! Max got a doodle book that showed you how to draw characters but left a large white area so you could practice right there on the sheet. It too was fabulous! Miriam got a little key chain toy called a Tamagotchi. It is a silly little thing that you have to check in on, feed, play with, etc. It was small and cute and a great toy for her. - Socks. For the trip itself, a blog had suggested the kids wear socks and shoes and not sandals on plane rides because of when they would have to go through security. While we did let them wear either shoes or sandals, they all had to wear socks and it was a truly brilliant idea. - Gum, but not too much. We did have the kids chew gum for take off and landing on the first flight but I think we pushed it too much and by the second flight the kids never wanted to chew gum again. (I felt the same way.) I think now it was the flavor of gum, it was fruity not minty, and I think it was a bad choice. By the end of our flights we just had the kids yawn instead of chew gum and it worked just as well. - Barf bag on hand. Oddly enough, there was not a barf bag in front of each seat. Before taking off I double checked each kids' seat to make sure a barf bag was in front of them just in case. A blog has said that kids can get sick at landing more often than take off so I wanted them to be prepared. None of our kids got sick during the take off or landing but Miriam got nauseous during the middle of each long flight right after eating dinner. She didn't throw up, but she really thought she was going to and dry heaved a few times before falling asleep. - Journal. This was our friend Angie's suggestion so before we left I got each kid a hand picked journal for the trip. To be honest, Max was the only one who used his on the plane, but Zeke and Miriam definitely used theirs on the car rides back and forth across Czech. Either way, it was great they had a blank book all to themselves to record or do whatever they wanted. Zeke recorded the things he saw, Max & Miriam wrote songs with dance moves, etc. - Empty water bottles. A blog pointed out that it is easy to dehydrate on a plane ride and to make sure to keep kids especially well hydrated. I got each of the kids the new style of CamelBak Water Bottles with built in straws in hopes of more water drinking and less water spilling. They worked fabulous! The only spill was by ME when I spilled OJ into Josh's computer bag. Yep, that was the one accident on our entire trip. Lucky me! - Good meals before flights. 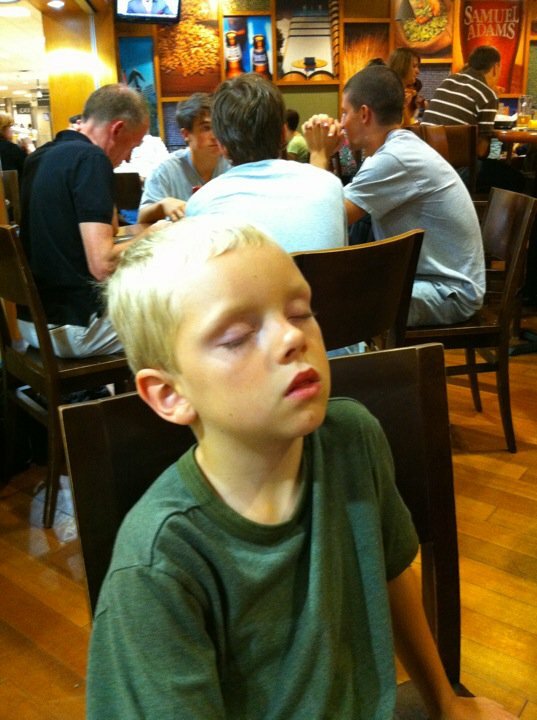 Same blog recommended making sure the kids ate good and healthy meals before getting onto the flights. Due to timing, I packed a sack lunch that we all ate before we boarded our noon flight to Atlanta because they were not serving meals on that flight. Having a balanced meal with meat, dairy, grain, fruit, veggies, really helped them. - Healthy snacks. I packed a ton, I mean a ton, of granola bars and fruit leather. I got ones high in fiber because constipation due to nerves was another comment I had read. While I could've brought more, it was really great for flight-sake and English camp-sake we brought as much as we did. - iPad. Our kids don't have game boy/ DS type of toys and most blogs recommended just letting the kids play with those on planes. However, our kids do have a gadet dad who has an iPad. Josh loaded the iPad with movies & games for the kids. This proved to be a huge blessing because all the movies they played on the plane were strictly for adults and not for kids. We did ration their time on the iPad so they weren't glued to it constantly, a little here and a little there, but they really enjoyed it when they did get to use it. - A Relaxed Mama. Like I mentioned, I don't like flying, but God really gave me grace and I constantly kept looking at the kids and smiling and making them feel comfortable and safe. Only one cutie, on our way to the airport was getting kind of nervous but thankfully, with much prayer, they were calm when the time came to fly. But in all honesty, I can't wait to travel on a plane with them again! *Ok, ok... the one more thing I'd do different would be to have us save a little more money so we could let Long-Legged Josh sit in First Class, :)! Response to Snak... I mean, Kids on a Plane! this was a good read :) glad it went so well for you guys- you were nice and prepared- i will have to remember this stuff :) where did you get the water bottles? the kids have some now that have been spilling and leaking so i was thinking new ones for x mas would be a fun idea. I just got them at Sheels when they were on sale for 20% off. I am sure if you searched around there are better deals to be had, :)!